My husband and I decided to visit Costa Rica in 2014. Neither of us are resort-type travelers. We both enjoy going off the beaten path, eating the local food and getting a feel for the local population. We split our time between a few areas, but by far, our favourite part of the trip was our stay at the Howler Monkey Hotel in Cabuya, a few minutes past Montezuma on the Nicoya Peninsula. I always wanted to stay in a tree house. This was close. 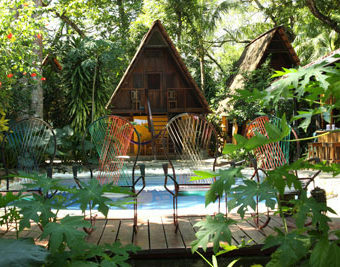 We stayed in a small A-frame cabin, often referred to as a jungalow, in the jungle, a few steps from the ocean. We saw more wildlife at this adventure hotel than we did touring the Caño Nego Nature Reserve a few days prior. We returned to the Howler Monkey Hotel in 2015 and are planning to return by the end of 2016. 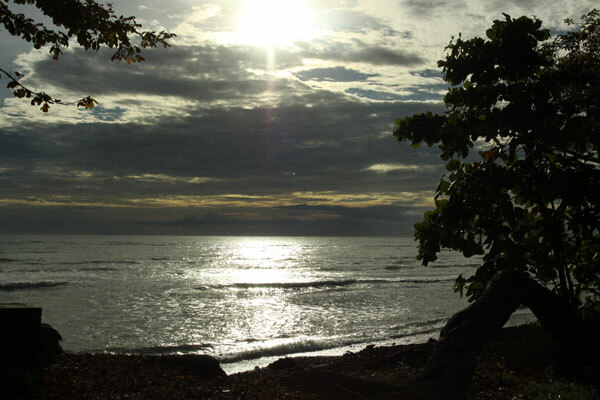 Cabuya is a small fishing village at the end of the Nicoya Peninsula past Montezuma, just before you get to the Cabo Blanco Absolute Nature Reserve. Our plan was to use the Howler Monkey Hotel as our “pied-à-terre” and explore the surrounding area. We did, and my husband did go fishing, but we found ourselves spending more time walking the rocky shore, sitting in the rocking chairs by the pool at the hotel, reading a book in the hammock, and enjoying the wildlife all around us. With my camera in tow, I took many, many pictures, some shared in this blog. 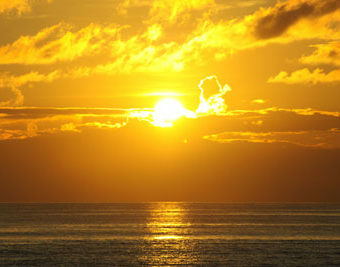 One of many sunrises at the Howler Monkey Hotel. Rocking chairs by the pool. I still remember being fascinated by the sounds of the jungle on the first night, and my excitement when I first heard the howler monkeys early the next morning. If you love nature, you cannot beat it. Every morning, the owner of the hotel, ex-pat Jim O’Callaghan, made us fresh Costa Rican coffee. We took our mugs to the beach and often watched the sun rise and the wildlife wake up, often taking Jim’s dogs with us. 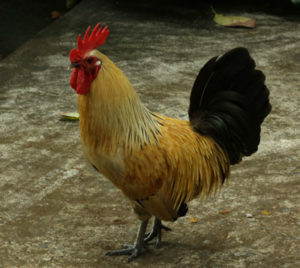 Did I mention that I adopted the neighbour’s rooster, now named Mr. Foo? Mr. Foo was still around come our second visit. He even recognized my voice. The friendly neighbourhood rooster, Mr. Foo. One night, Jim and a few of us bought fish from the local merchant, and with all the visitors at the hotel, had a potluck BBQ. In 1998, Jim came to Costa Rica on holidays like many of us. He fell in love with the country, went back to Ireland to continue his work as a medical scientist, but was burning out. He sold everything, and in 2005 moved to Costa Rica where he bought the Howler Monkey Hotel. All you have to do is read the TripAdvisor reviews about the Howler Monkey Hotel to realize that most of Jim’s customers feel the same way my husband and I do about the place. It’s been called “a little slice of heaven”, “beautiful, untouched Costa Rica” and many other very deserving names. 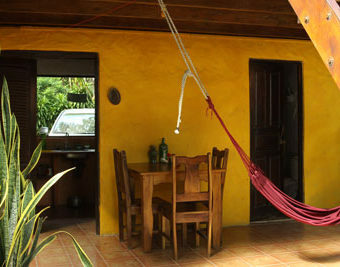 If you are looking for a laid back, quiet place to experience the true, untouched nature of Costa Rica, the Howler Monkey Hotel is the place for you. Visit our Adventure Hotels of Costa Rica profile at www.adventurehotelsofcostarica.com/hotel/howler-monkey-hotel/ or our website at www.howlermonkeyhotel.com, or send Jim an email at info@howlermonkeyhotel.com to make reservations. You can also call the hotel at 506-2642-0303. If you are wondering how I came to be writing this blog, simple, I am retired from one career and decided to get into web design. Jim needed a new website for his small business and I needed the practice. I also have a background in technical writing and love to take photos. On a beautiful starry Costa Rican night, my husband, Jim and I were sitting in the rocking chairs by his pool, and I offered to create a website for the Howler Monkey Hotel. Jim said go for it. And here we are. As my skills evolve, we revamp the website, add to this blog, and find ways to to attract customers to this small adventure hotel, where the Costa Rican pace of life is just what the doctor ordered.